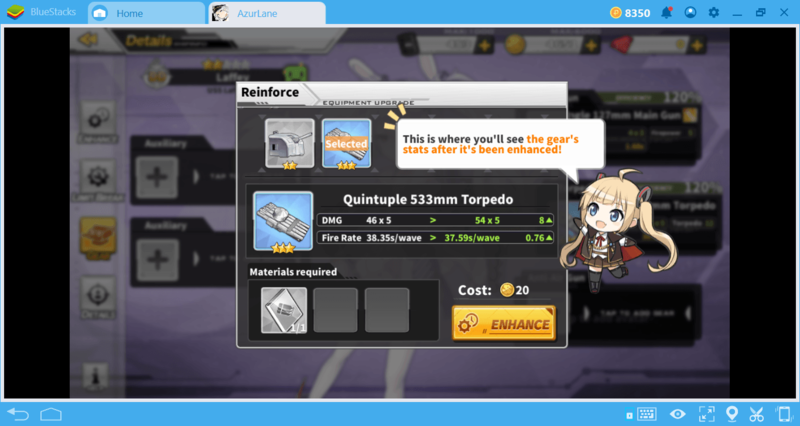 Azur Lane is a fairly new game and it has some peculiar mechanics. It may take time for you to discover them all and start playing the game more efficiently. Even if you are a veteran, you may not be aware of the existence of some mechanics. Do not worry: No matter your level of experience, you can use the tips and tricks in this guide to make your job easier. If you think 5-star ships are rare, try getting a 6-star ship. The 6 stars are of a particular type of ship where it is extremely difficult to get to during normal play, and you may not get such a ship even if you play for weeks. However, if you log in the game every day for just one week, you can get this ship for free. Don’t forget to claim your free 6-star ship after you logged in enough, it will be delivered via mail. If you love Waifu girls, collecting different skins is also very important for you. 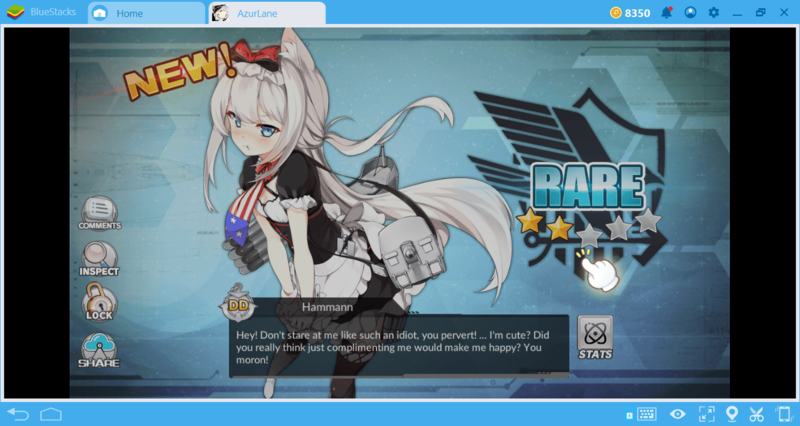 There are many skins in Azur Lane, but most of them are sold for gems. If you do not want to spend your gems, you can earn free skins by completing some event missions. This type of missions are regularly updated and offer a new skin every time, so be sure to check them often. 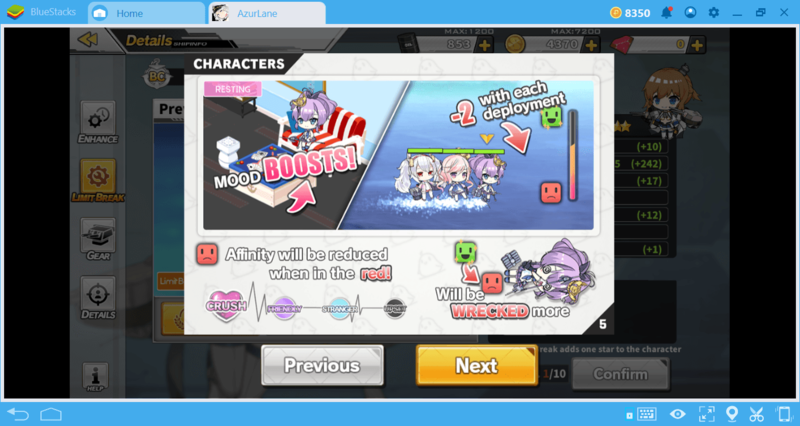 Azur Lane has a very unique mechanic: affinity levels. Your ships have four different levels of emotion, which directly affect how successful they are on the battlefield. Each ship begins with the “stranger” level. The more you upgrade a ship and let it rest, the higher the level of affinity. Ships that reach the “crush” level provide several advantages, such as shorter cooldown times. But beware: The affinity level can drop very easily too. If you use a ship very often, this level falls to “upset”. In this case, even with a strong ship, you may have difficulty winning battles. Think of your ships as real people: Working constantly will cause their morale to deteriorate. Therefore, remember to change the ships in your fleet frequently and let them rest. When a battle is over, the prizes you get will change according to how efficient you were. You have additional goals in every battle and you can win more prizes by completing them. The most common of these additional goals is to end the battle in under 120 seconds. Try to end all battles in less than 2 minutes: You will receive more rewards than usual. If you don’t like the results after building a ship, don’t think of re-rolling and giving it another go. 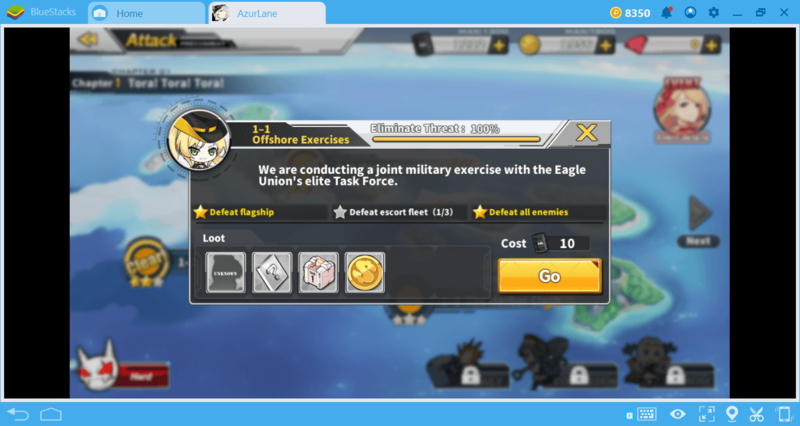 This tactic that can work in games like Knight Chronicles is completely useless for Azur Lane. First of all, the list of the best ships in the game is still unclear, so we lack the data that can evaluate the results. However, the most important reason is that there is only 7% probability of getting a ship at SR (super rare) level. You may not get the results you want even if you re-roll for weeks. 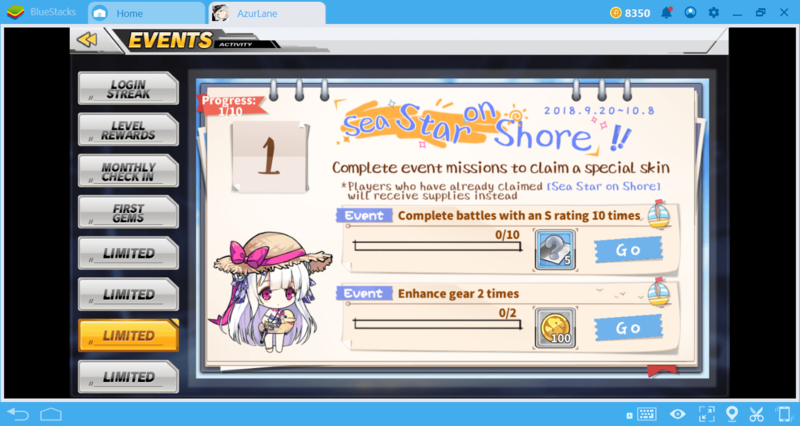 Azur Lane is very generous when it comes to awarding with new ships. So, instead of re-rolling, just keep playing the game. You can retire all ships that you are not using or haven’t used for a long time. There is no point in keeping them in your inventory. Instead, you can retire them and get resources and “medal of honors” in return. 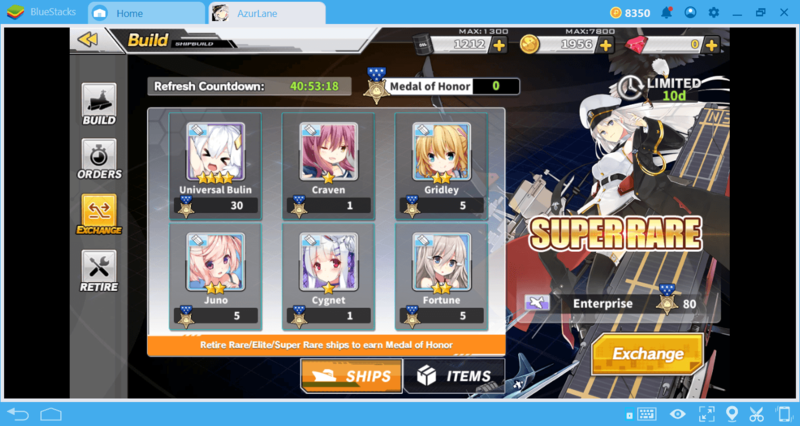 Medal of honor is a very important item because you can exchange them for high-level ships. So by using this method, you can earn high-quality ships free of charge. Both options are available on the ”Build“ screen. You can complete any mission that you completed again. You will continue to win prizes, and if you manage to achieve additional goals, their amount will be more. If you are having difficulty with a mission, give another go to the previous task you completed. In fact, since some missions award with random ships, this can be used as a “farming” tactic: Keep completing the same mission over and over and keep getting new ships. You know you can improve your ships, but did you know you could improve their gear too? You can enhance all the gear you put on a ship. This will increase both their damage and fire rate. You can collect the necessary materials for this process from the mission awards. Remember to check the gear condition of the ships in your fleet frequently and try to improve each one. The Academy screen may seem boring, but it’s quite important. 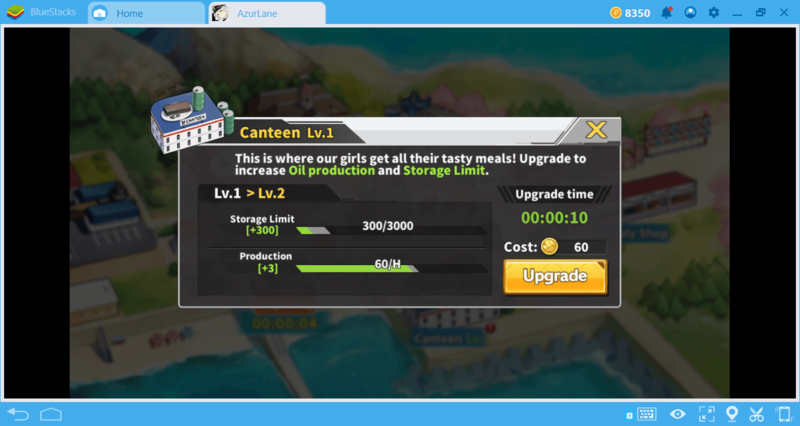 The amount of oil required to participate in the battles is growing steadily and if you want to continue to get it for free, you must keep raising the level of the Canteen building constantly. As each upgrade requires a certain amount of time to complete, we recommend that you start to upgrade this building right at the beginning of the game and keep upgrading without missing a beat. 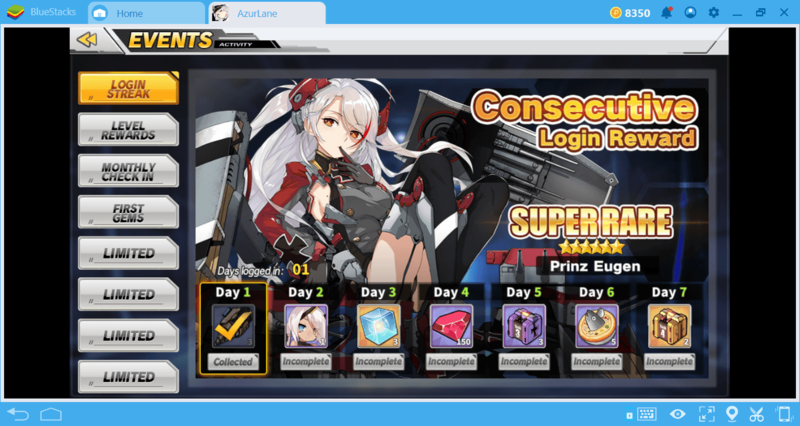 These are the tips and advice that will help you most about Azur Lane, but you can continue to learn more by reading the other guides we have prepared. 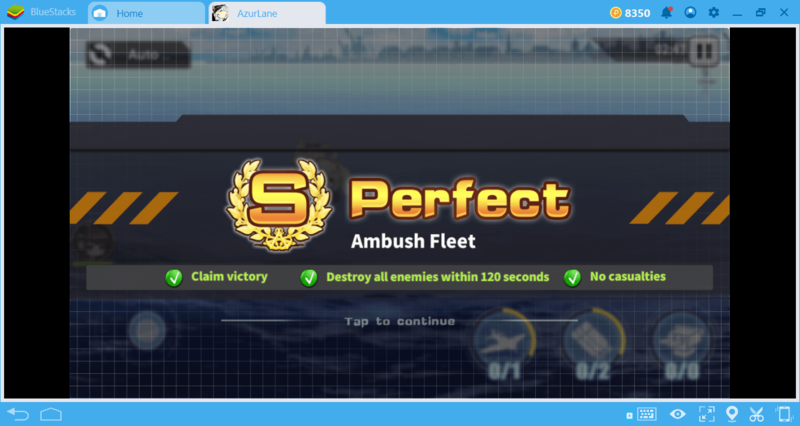 Here’s another very important tip: Using your mouse, you can move your ships faster, and win battles much easier. Using BlueStacks 4 will provide you mouse and keyboard controls and offer a much more enjoyable experience.